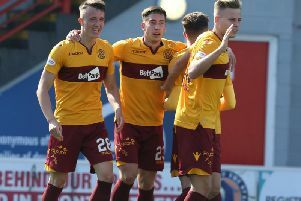 Motherwell FC supremo Alan Burrows has told the Motherwell Times that the Steelmen will not be selling top scorer Louis Moult to Aberdeen on the cheap. The Dons have already had a near £400,000 offer for the prolific hitman rejected this summer but are expected to further increase their offer in a bid to take Moult to Pittodrie. “It’s going to take a lot more than what’s been offered to get Louis out of Motherwell,” Burrows said. “We have offered him a contract, a deal to be the highest paid player at the club. “He is considering that. Football’s unpredictable. I could be sitting here today, Louis could be a Motherwell player and then somebody could come in out the blue on Monday and offer £750,000, £1 million or £1.5 million, whatever it might be and then the club need to think about it. “It would be wrong of me to promise supporters or anybody that Louis is going to be a Motherwell player next year. Moult, who has one year left on his existing Motherwell contract, has undergone a groin operation this summer and returned to training on Monday. It is expected to be another fortnight before he is match fit. Meanwhile, Burrows said that a national story linking Moult with a move to English big guns Crystal Palace in the January transfer window was “a load of rubbish”. Burrows said that the story aired six months ago was a complete falsehood as then Crystal Palace manager Sam Allardyce wouldn’t even have been aware of Moult’s talents. “That story was a load of rubbish,” chief operating officer Burrows said. “Sam Allardyce was operating at a level with Crystal Palace at that point in which he was dealing with guys at 15, 20 or 30 million pounds. “Things are put into the media by certain people at certain times for various reasons.